Component does not come with mounting hardware or wiring. Was removed from functional equipment. Manufacturer: Nana Electronics. SKU: 40696U. I GBT power modules,diodes. Just try,you will find any you. Product View. need here! relay sensors,fans and so son. 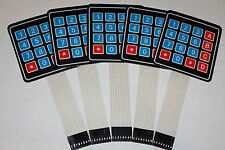 5 PCS 4x4 Matrix Array 16 Key Membrane Switch Keypad,Arduino/AVR/PI​C USA SHIP ! Switch travel: touch-type: 0.6 ~ 1.5mm. Dielectric Strength: 250VRms (50 ~ 60Hz 1min). Electric shock jitter: <5ms. AJM ENTERPRISES INC. We have several warehouses and box trailers full of all types of materials! A very partial list of current inventory is listed below. We are open M to F from 8 am to 5 pm. 96970930 NA A13. Thickness 0.125. QTY (2) HALLO MODEL CS-14. Actual Weight: 0.1Kg. A:Hmmmnnnn yes. WARRANTY |. 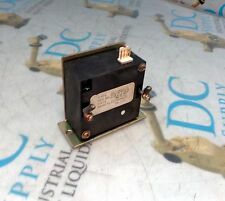 ST CLB Circuit Breaker Block Jumper. GE Control Plugging Switch #CR2962 F2A volts New Old Stock - Never Used. AJM ENTERPRISES INC. We have several warehouses and box trailers full of all types of materials! A very partial list of current inventory is listed below. Cross Linked polyolefin tubing is much stronger than PVC tubing and will not burn like PVC. Shrinks to form a water tight seal and the ultimate vibration and strain relief. Brazed seam for maximum strength. Up for sale is a lot of 3 Brush Assemblies. Manufacturer: Tolstrut. 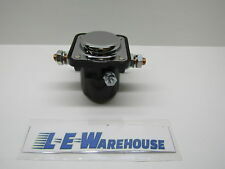 Manufacturer Part Number: 3-1/2" OD. Manufacturer: Burndy. Manufacturer Part Number: 14-2T 2R. The cover on this indicates it is an amateur radio log book but at the top it reads Engineering Data and Specifications Handbook. There are 26 photos of the item below. ---I don't have a way to arrange for a local pick-up of this item, I'm sorry for the inconvienence. Bus Material Tin-Plated Copper CDA 110/UNS11000. 48 Volts DC Maximum. Combines negative and positive buses on one block. Manufacturer: SMC. Manufacturer Part Number: VQZ115-6LO-N7. Manufacturer: Dottie. Manufacturer Part Number: D12. Tin-plated copper bus for maximum conductivity and resistance to corrosion. Bus Material Tin-Plated Copper CDA 110/UNS11000. 150 Amperes DC. Press on insulating cover attaches to studs and allows unobstructed wire access. 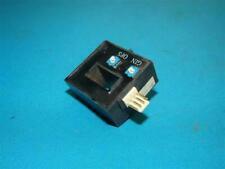 Piezo Buzzer, 30mm 5-30V 85DB. Especially suitable for use with the new 701-MDCZ CZone optimized motorized battery switch, this piezo buzzer is also useful wherever a single tone alarm is required. Bus Material Tin-Plated Copper CDA 110/UNS11000. 48 Volts DC Maximum. Cover Material ABS. AC 13A Port/Plug with Ingrated Extension Cable - 125V. Mounts to the exterior of any vehicle to make the charging port accessible in a more convenient location. ANCOR Marine Grade lugs are manufactured from heavy duty annealed tinned brass, providing for maximum current flow. Stud Size: 3/8 ". Size: 1" Wide x 6" Long x 1/4" Thick with (4) 13/32" Threaded holes & (2) 1/4" Threaded mounting holes. You are purchasing this product from Whites Hot Deals. Part #: 2105. Bus Material Tin-Plated Copper CDA 110/UNS11000. Continuous Amperage 250 AC/DC. For installing batteries in tight, confined spaces, the design of these connectors is perfect. They're easy to disconnect for quick, convenient changing and a plastic cover eliminates the risk of electrical shock. ANCOR Marine Grade lugs are manufactured from heavy duty annealed tinned brass, providing for maximum current flow. Stud Size: 5/16 ". Serial No. 1460. Volts 120/240. Manufacturer Part Number: 25Z0010NCM. Manufacturer: Peter Paul. Watertight cap. 2 USB ports. Easy installation. Protected from overheating. We have no responsibilities or liabilities for manufacture, installation or use of these products. WE TAKE CREDIT CARDS. Manufacturer: Kodiak. Condition Note : Item is used in good working condition, see pictures for details. Manufacturer Part Number: KA29U. Manufacturer: Burndy. Busbar HD 8 Stud 650A. Pro Installer buss bars are designed for flexibility and scalability. it is easy to link other Pro Installer products to the buss bars because of the common interconnection height in the product line. Make sure the item you are Purchasing is the correct one for your application. Manufacturer Part Number. Serial No. 5019. Hertz 60/50.